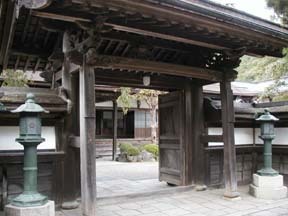 Temple Lodging in Japan "Seizyosin-in"
Seizyosin-in is located by the entrance of the approach to the back of the temple. It has a very nice appearance. 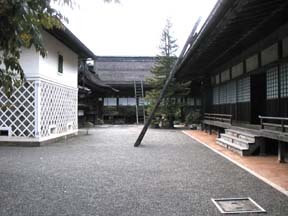 The room was a wide room of 12 tatami mats in size. 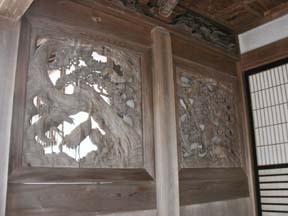 It was a good room with flowers and a calligraphy scroll hung in the alcove. It was equipped with a TV set and you can take a bath from 16:00. The bath was a wooden bath a little larger than a house bath and had two chairs and two basins. The water was rather hot. As for me, I felt really good in the bath. The restroom had a wooden door and so you can smell the wood. It was a flush toilet, and it was clean. The meals are served at 17:30. Possibly because not many guests were staying there due to a typhoon, I saw the meals arranged in the room next to mine when I opened the sliding door. There were many delicious dishes, which made me quite happy. When I went back to my room after dinner, the futon mattress had already been laid out. I did not have many occasions to talk with a priest. 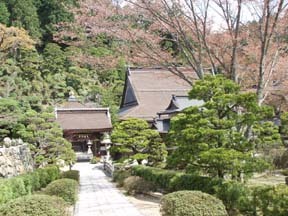 If you wish to give a religious memorial service for a deceased person, they are available for 2,000 yen or more. You have to ask for it by the previous night. In the morning service, they chant a sutra with unique tones, which was very interesting. After the service, they let us see a hidden Buddha image. They say that it is a privilege for the shukubo guests only.